The MSX group ANMA brought us many high-quality demos and games in the 1990's, all including amazing soundtracks. All handmade with their own music tracker called RED. This gem is now available from the MRC download database, and free to use. The release comes with all the great ANMA tunes we got to love so much. Back in the days, the good-old-days, when MSX was the center piece of many homes, there was a very lively demo scene going on. 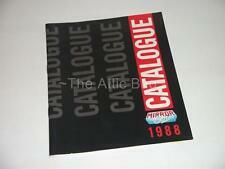 It was then when MSX programmers awoke and showed of their artistic skills like coding, graphics and music. The 1990s brought us an overwhelming bunch of new demo software, many new MSX scene groups popped-up. And ANMA, short for ANdre & MArtijn (Knightram), the "boys" behind it, was one of those. Boys indeed, they where only 15 years old while entering the MSX demo scene. It were the teen's wonder years, like many of us MSX geeks. ANMA brought us masterpieces like "the anti-rip demo" and, their pinnacle, "source of power". It wouldn't take long for ANMA to shift their attention from making demos to making MSX games. 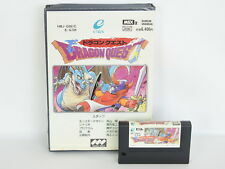 Games like Squeek, Troxx, No Fuss and Frantic entered the MSX gaming market. Again with the same quality we were used to see, and hear!, from their earlier demos. All their soundtracks where handmade with their own music editor called RED. 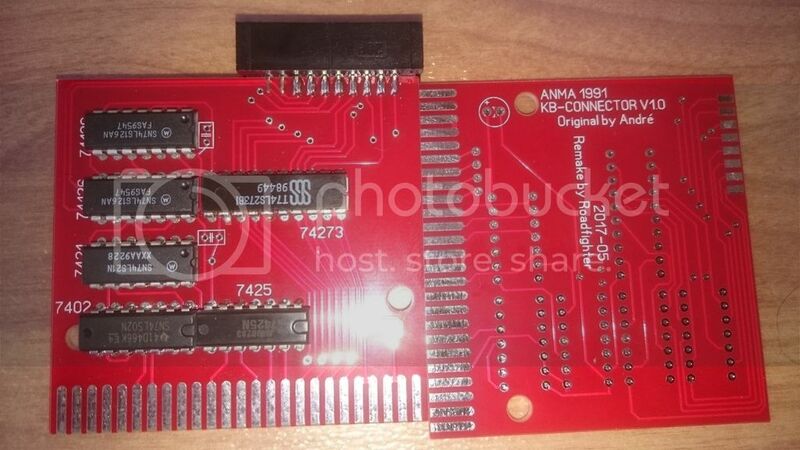 RED stands for (music) Recorder/EDitor and is original ANMA MSX software. Although there where a handful of good music trackers around, ANMA choose to make their own. Simply because Martijn and Knightram didn't like the other available trackers. And for practical reasons, Andre wanted a very fast replay routine with minimum CPU usage with support mainstream soundchips like PSG and OPLL (MSX-MUSIC). RED has a lot of special effects (sliding, vibrating, volume manipulation, etc) and also special PSG effects to simulate drums. RED also supports a Philips Music keyboard NMS 1160 connected to a custom made interface to make composing easier. While this software was publicly released years ago on the "MCCM Millenium CD 1", it was without a manual and wasn't known to many people. Now, ANMA's RED including music (and more) has been added to the MRC download database, uploaded directly from the Source (of Power) by MRC user stompetower, André Ligthart. This is very very interresting. Btw, interesting read: The Story Of ANMA: Two Schoolboys And A Game Development Dream (Gamasutra). Also game images have been added, later on today the cheats, for Frantic, No Fuss, Nosh, Squeek and Troxx will be added as well. @ren: indeed a really nice article about MSX and ANMA. Very nice written. The manual states that ANMA only used the '6 FM voices + drums' mode. That is true for almost all compositions. However, there is at least one composition where the '9 FM voices' mode was used ('NOSHINTR.AMU'). This composition is on the 'v1 Music(5)... .dsk' disc. If you did not already know: the OPLL chip (MSX-MUSIC) supports either '6 FM voices + 5 drum voices' or '9 FM voices without drums'. I made a pcb from Keyboard interface out of the info in the RED keyboard interface folder. And it wont fit in to a cartridge box because the 7402 is to close to the hole in the pcb. Ah what the heck is a prototype. 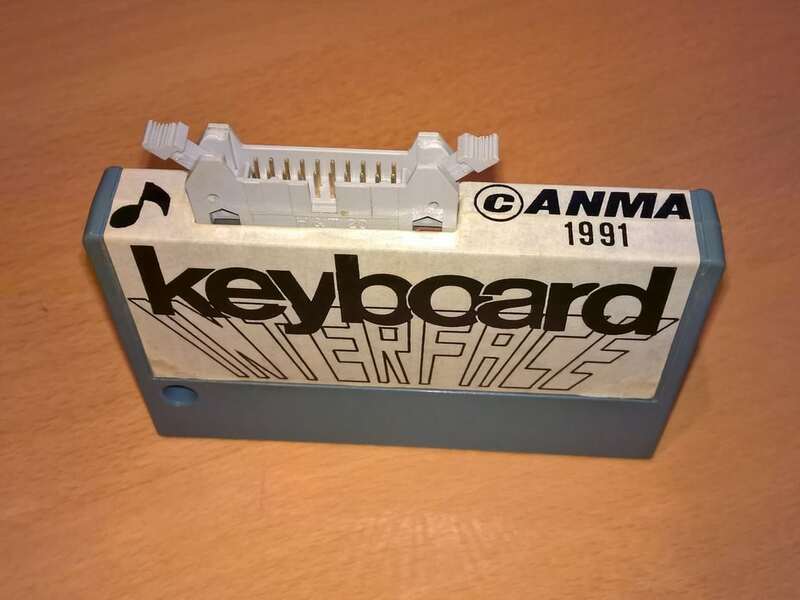 So I understand that you own a Philips keyboard (NMS-1160) and can now use that within ANMA's RED? By the way, I think you shared an image in your post? It does not load (error 403, Forbidden). Yes I did post a image, I will send it again later. It works like it suppose to, I think. Let's say I think it works correct but I really have no clue how the software works. Sorry that it took me so long to try out this editor, but WOW... you have included all the old music from your games and demos... THANK YOU SO MUCH!! Some of my favorite tunes are here, like music from No Fuzz and the Antirip demo, now I can enjoy them whenever I want, thank you. I haven't tried the editor itself yet, it seems to be a very advanced tracker for its time. I will give it a spin sometimes. The correct note should appear in the editor when you simply push a piano key. With [CTRL]-[F2] you can shift octaves (Philips keyboard has less octaves than the PSG/OPLL chips). With [F3] / [F4] / [F5] you can change the volume/instrument/effect that will appear after each input. With [F9] you set the number of lines the cursor should move downward after each input. With [F2] you enter RECORD-mode to record a track while playing other tracks (like a bass/drum line). See also the little manual in the download, if you can read Dutch. Use [SELECT] to walk through all the shortcuts/settings. This is the result, with flaws as i described above. And yes it works, when i load RED, and press any key on the keyboard the play the note and appear in the editor. Your pcb looks better than the original (which was etched by a local electronics shop in Hoorn). B.T.W. André do you have the original Disk sticker ? probably in dynamic publisher format ? Or at least a hi-res scan ? I tried the interface once more and all the keys of the keyboard work except the last one "the highest note". Thanks again for releasing the music editor and musics. The songs I play by MIDI-Pac of WORP its great. Yes, Disk sticker was Dynamic Publisher format, but I do not have that anymore. The interface label was hand drawn with the use of 'Dry Transfer' (Dutch='wrijfletters'), like this. These letters were also used for the pcb and even for our 'ugly' box/cover designs (most printers were so bad in that time). Both labels were covered with thin transparant plastic adhesive. The picture i posted is no longer visible from photobucket so i put up a new link for those who still want to have a peek. For those interested I have 9 off the PCB left, they don't have gold contacts. They are 3 euro a piece without shipping. ALso keep in mind the 2 chips(7402 and 7425) that are a bit to close to each other, the need some shaving but they fit) Also the pcb will fit in a overich konami casing but needs some work to. or 15 euro for the PCB assembled and tested. So, if you own a Philips keyboard NMS-1160 and want to use ANMA's RED how Knightram did, then roadfigher's offer might be interesting. With the keyboard connected, editing music within RED is much more easy. Also real-time recording is possible while other tracks (like bass/drums) run. why did you create this keyboard interface while there already was a philips music module? cheaper than an actual music module perhaps? Yes, it needs to be cleaned up a bit, been gathering dust for several years in the living room. @Hydragon: yes, that's the one we had too. I am pretty sure you have the NMS-1160. AFAIK, Philips made only one. It must have a ribbon cable that fits the connector above. Then it's 100% I believe. 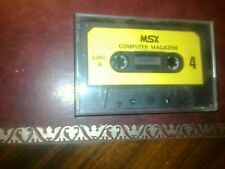 @Meits: main reason was that we made music for MSX-MUSIC and PSG, not MSX-AUDIO. We used a Sony HB-F700P computer and the cartridge slots were too close together to fit both a FM-PAC and a Philips Music Module. Other reason: I did not know how to 'scan' the keyboard via the Music Module. So building this interface prevented us from buying another MSX-2 computer (Sony was my favourite) as well as reverse-engineer the workings of the Music Module. Actually Toshiba's and Yamaha's keyboard also fits the Music Module (and vice versa), but they're not pin-compatible . Philips has a different pin configuration than usual. But either way if you're connecting a Philips to a Philips, should be all good. Ah, that evil Sony again. I had that problem as well. Since I had a clone fm-pac from MK-Public Domain I cut a corner out of its casing so the music module could fit. I still wonder why Sony put the cartridgeslots up side down in these machines. I don't think they're really upside down. The label faces front, doesn't it? 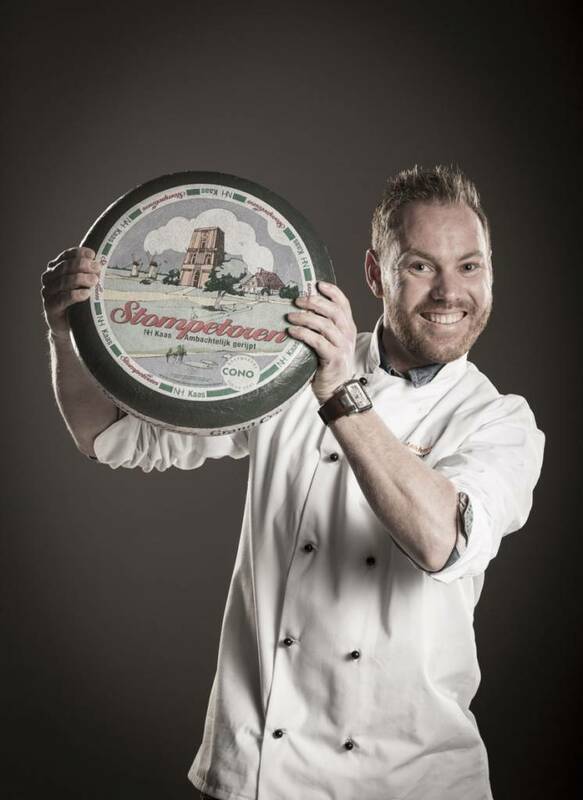 And top label will de readable. there's a front and a top of a cartridge. The front is never readable as it faces the desk. the top is mostly up side down. It was about to happen to my case mod as well, but I didn't like the idea of that, therefore I put a long flatcable there with a twist in it. Only computers I know of are the Sony's. What are some other examples? It shouldn't be too hard to put them straight up by design as all computers I've seen with back slots are straight up as well. It should still be fairly easy to place them straight up as the slots aren't mounted on the mainboard, but connected by cable. On the back they face up of course, also on a Sony. It's the same orientation as the front slots, as in: the left side of the cartridge is on the left side in both cases. 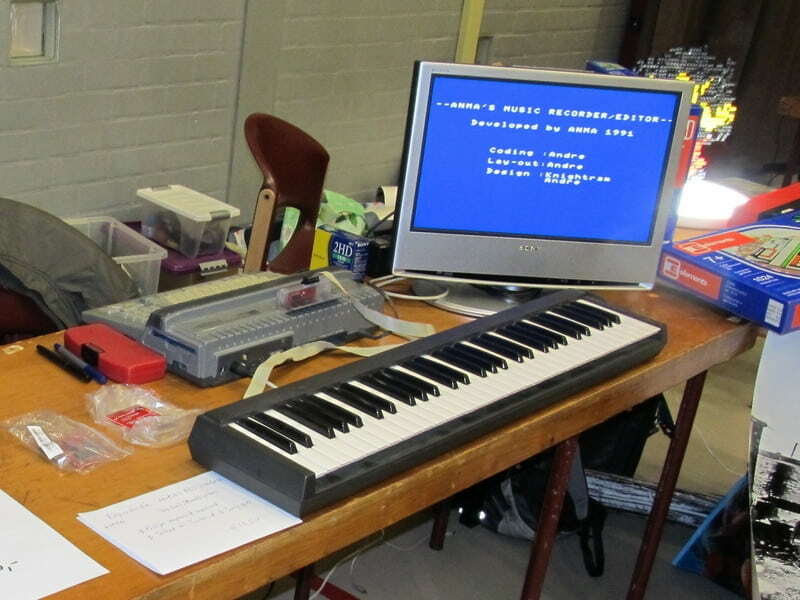 Is that you with your stand at MSX Fair Nijmegen 2019 with ANMA's RED and your remake of the KB-interface? Nope, i had a birthday to attend to so could not make it. 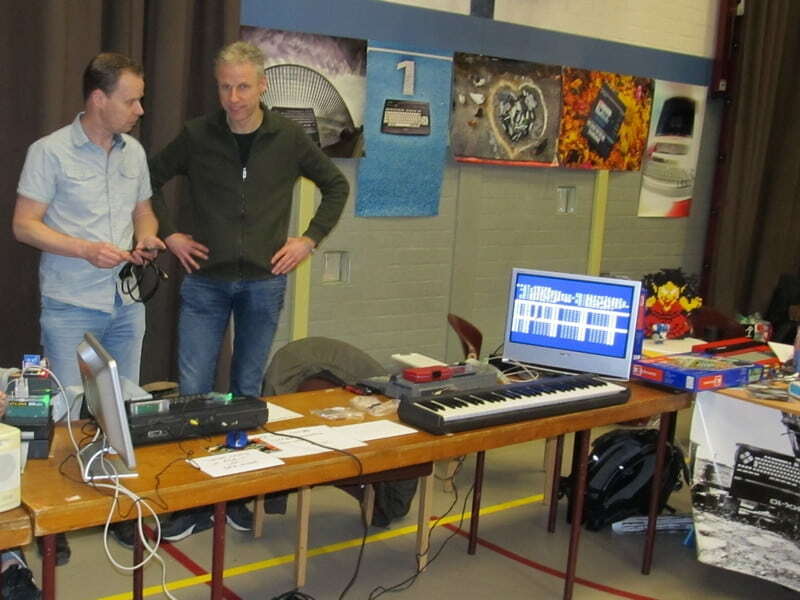 But Robbert-Jan (right guy in the photo, next to Frits Hilderink(Left)) had the setup at the TMT-Logic stand. They where demonstrating the DAB+ Radio and i had still some pcb's left so i gave them to him to sell. Still have 2 of them (without a cartridge case) so if interested please contact me through my profile.